When was the last time you made fresh footprints on a beach? The only footprints! It is a special and restorative experience. It is almost impossible to find a beach that seems like it is your own private beach. At least, one that is accessible. 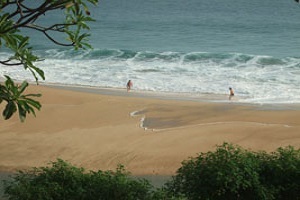 There is such a beach, not so far from Puerto Vallarta, in the state of Jalisco, Mexico. Actually, it is part of the south coast of Jalisco. An area to be discovered, and soon will be. It is only a matter of time, and the natural migration of those who have had enough of the crowded beaches north of Puerto Vallarta. A photo of the beach at Sayulita, an hour plus drive north of Vallarta, during Easter week is enough to make one long for a time 15 years ago, when you had the place to yourself. Well, there is no going back, so maybe it is time to start exploring. Maybe make a plan to drive south for a change. Less traffic. Attractions like the botanical gardens. Towns like El Tuito to discover. Be sure to stop at the roadside bread stand on the way at El Columpo. Fresh hot little breads filled with chocolate, cheese, and fruits. Drive though pine forests, and feel the fresh cool mountain air. From the town of Tuito, head to the beaches for a day or maybe an overnight stay. When you see the beaches, you will want to stay. It is that kind of place. Find that piece of beach and make your footprints. My favorite time at Chachalaka is early morning or as the sun is setting. The light is best then, especially if waves are washing over your footprints.